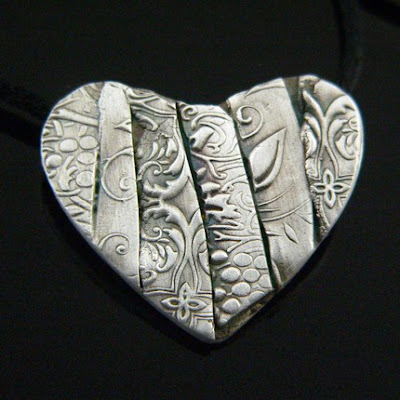 In this class you will learn the fundamentals of working with Art Clay Silver. We will mold, shape and texture this revolutionary material to create your own one of a kind, fine silver jewellery. During the class, you will have the opportunity to create earrings, charms, or a pendant. All materials included! It is always a lot of fun. I teach you the basics and encourage students to create something truly unique beautiful. There is no one specific project but you can make charms, pendants, earrings or simple components. Sorry we do not complete rings in this class. Come join us, it is a lot of fun. Cost is $200 plus tax and included silver. Bring your enthusiasm and lunch, coffee, tea and pop are provided. ‘tis the season! The season to make money that is! Yippeee!!! Retail is a fickle business, it’s inconsistent, unpredictable and persnickety. But the one thing you can count on is that people will buy gifts during the next 3 months. So buckle down and get ready. First you have to think about what you’re going to make. Then you decide how much of it to make. Then you get down to work and make. Every season requires new work. Repeat customers like to see your collection looking fresh all the time and new work provides your diehard fans with new buying opportunities. As the holiday season approaches most of your customers are buying gifts. When buying gifts, people are looking for smaller items, smaller meaning cheaper. Most people are buying long lists of items and are on a strict budget. Having a variety of price points helps your customer. They may be looking for one special item at $100, 3 items for $50 and 10 items priced under $30. The more choice you can give them the more sales you will make. If you design holiday-specific items (Santa hair clips anyone?) now is the time to bring them out. Don’t wait until 2 weeks before the day. Once I have an idea of what I want to make I need to work out how much of it to make. From there I can work out my supply shopping list and a schedule that means I make a certain amount each week and not all of my inventory the night before a show. So how much inventory should you make? I base my inventory numbers on my projected sales numbers. How much will you sell? Guess. Seriously, guess. There is no formula for calculating your sales. That said, you can make an educated guess. If you’ve sold in previous holiday seasons you will have a rough idea, last years’ sales + 10% (you’ve improved so much!). If you are doing a show you can guesstimate based on your booth cost. Your booth cost should by 10 – 20% of your sales. Using this, if you are doing a show that cost $100 you can expect to sell $500 - $1000. Aim for the higher number. As for online sales, again, base your guess on last year. Consider how much you’ve worked to promote and market your online store over the past year. The difference between shows and online sales is with shows you have to make the inventory before you go to a show. Once you have an idea of how much you’ll sell you can calculate how much inventory to make. Let’s say your goal is to sell $1,000. If you are doing a show you should make a minimum amount of $2,000 to take with you. It is very important that you never run out of work at a show. This is a 2:1 inventory to sales ratio. Let’s break that inventory number down further. If everybody purchases only 1 item you make 29 sales for a total of $1,000. Not a lot is it? Hardly enough to fill a table let alone a larger booth. Do yourself a favour, resist the temptation to make a huge inventory to fill the booth. It’s better to get creative with your display. Let’s look at why. If you are running your costs at about 25% then to make $2,000 of inventory you will pay $500. Now you go to your show and sell $1,000. All of a sudden that $1,000 doesn’t look so fabulous anymore. Now let’s look at what happens when you go overboard with inventory. What???? You actually lost money at the show even though you sold $1,000! Technically you haven’t lost money because you have $3,000 worth of inventory sitting in a box. This will be fine if you are doing a lot of shows. If however you are not doing a show for a while, or are not selling a lot of work online (at least the same as at a show) then you now have money invested in work sitting in a box and no money in the bank. For this season you need to take a realistic look at where you are selling, how much you anticipate selling and how much you think you should make. I’m lucky here. I’m signed up for 3 shows and all of these are repeat shows. I also sold online for the past several years so I can track my sales. I’m adding 20% to my online sales expectations because I’ve worked hard to market myself more and I increased my mailing list significantly. So using my sales goal I’ve made myself a target number for inventory. I have 6 weeks before my first show, November 7. By that date all my inventory should be made. I took my sales goal and divided by 6. That is the amount of finished inventory that I must make every week. For me “finished inventory” means the item is completed, in a bag with a price tag on it. As to what I’ll make for that inventory, well, I’ll be honest. After 9 years of being a full-time seller I’ll let you in on a secret. I have no idea what to make. What people decide to buy this year is a crap shoot. I’ve talked to many crafters, most of whom have been in this game much longer than I have and they tell me the same thing. You just never know what people will want. To end this post here’s a wrap up with homework for you. In celebration of their 15th anniversary, BeadWork magazine is having a beaded bead contest. Bead One is called Seeing Stars and is by Melinda Barta, editor of BeadWork. You can find this pattern in the February/March 2012 issue. Bead Two is Clustered Beaded Bead by Gwen Fisher and is in the April/May issue. Bead Three is the Stargazer Beaded Bead by Florence Turnour in the June/July issue. Bead Four is the Treasure Trove Beaded Bead by Cynthia Newcomer Daniel in the August/September issue. The last bead, Bead Five, is the Dewdrop Beaded Bead by Cindy Holsclaw which incorporates Tila's and drop beads. You can find it in the October/November issue. The contest is to make at least one of each beaded bead and incorporate them into one piece of jewelry. Deadline for entries is October 26, 2012. Visit beadingdaily.com/beadedbeadcontest for entry details and rules. On Fridays I have a beading day with my friend Gail Smith. 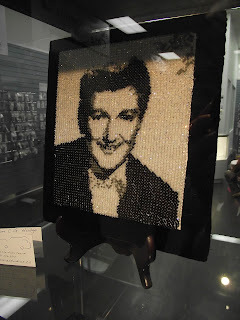 As we are both subscribers to the magazine, we have all the issues with the beaded patterns. We decided to tackle Bead Three: Stargazer Beaded Bead by Florence Turnour. Gail used Peridot and Capri Swarovski Elements bicones and I used Peridot and Violet bicones. Yes, the pattern called for rounds, but we're rebels. After years of raging against "those little beads", I concede that to you all that I like them. I think I may make another one using Swarovski Pearls instead of bicones. I'll keep you posted on the progress of the other beads. I hope you'll join me in participating in this contest. LunaSoft Cabochons at BeadFX! We have the totally delicious, yummy, JUICY new LunaSoft Cabochons. These are German-made Lucite cabochons - and they almost seem to glow! They are a soft, matte finish, and the metallic back reflects the light, so that it bounces around inside like crazy and comes out all yummy - to use the technical language. They come in squares, ovals and rounds, and if you think that a square moon makes no sense, then you haven't been playing Minecraft. Which you should maybe check out - as it is a hot new wave in computer games. You can build things - and you get to mine for diamonds! Anyway - you can bead bezels around these and they almost seem to float. Check 'em out! 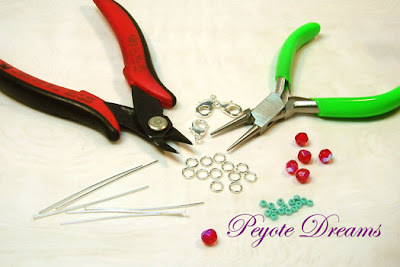 If you need some help with HOW to bead a bezel around a cabochon - which simply means that you use seedbeads to create a ring around the stone to hold it in place - anyway - if you need help with that - then check out Right-Angle Weave Stitch Workshop - which promises to teach you this and much, much more. Speaking of Bezels - check THIS out! These are bead bezels - or rivoli bezels, or for round cabochons - or - what have you. Pop a 14 mm bead into these, push the soft metal edge down onto the bead, and bingo - instant charm or pendant! These have a rotating bail on them too, so they are flexible in how you use them. They are quite exciting! We also have these - with an interior ledge or shelf - so you can glue a 16 mm cabochon into them. Say - something that you made in Resin? I leave it to your fertile imaginations to find ways to use them! And speaking of fertile imaginations - it doesn't actually require one to imagine that these bead caps (or cones) are actually Woodland Fairy Hats - immortalized in Brass, Antique Brass, Bright Copper, Antiqued Copper, Antiqued Silver, or Gunmetal. Although I'm struggling with reconciling "Gunmetal" and "Woodland Fairy" as two concepts that go together. Gunmetal is more appropriate for the Gnome hats, I think. And so, as always - wonderful things - new and old - all over the site. So click on a link or an image to go straight to the item mentioned, or go to our massive list of everything and look for the "new" tags. If that page seems overwhelming - which we freely admit it is! - then try for bite-size portions by checking out these categories: Firepolish, Pressed Glass, Swarovski Crystal, Seedbeads, Stone and Pearls, Preciosa Crystal, Metal Beads, Other Cool Beads, Findings, Metal Clay & Supplies or Books, Kits, Tools. And don't forget to check out our free, yes, free projects. Over 300 to choose from - a new one every week! Lampworking Studio is Now Open - Please call ahead to check availability and reserve a spot. Don't forget - we are at our new location - so don't automatically drive to the old place by mistake - details on our About Us page. I'm sure some of you faithful followers were wondering where today's blogpost was. Well, today was the Swarovski Launch at John Bead and I wanted to be able to share some pics with you. Robert Wylie and William Hodge from Armure Studios were in attendance to unveil a piece that John Bead commissioned. This portrait of Liberace is made entirely of 2mm Swarovski crystals. Fernando DaSilva, Create Your Style with Swarosvki Elements Ambassador and Creative Manager for John Bead launched his new line, Instant Glam by Fernando. This is a line of bezels and Swarovski Crystal Rocks that were inspired by the shapes of architecture found in Tuscany. I hope these arrive in the store soon....hint hint Marg!! I can see them filled with the Crystal Rocks, of course, but how about some Crystal Clay? Resin? Leather? My mind is exploding with all the possibilities. Join Pam Thursday evening (September 27th) from 6pm to 9pm for a fabulous introduction to jewelry making! Do you want to create jewellery for yourself but have no idea where to start? Join us for this 'newbie' course and discover just how easy creating jewellery can be. Participants will make a couple of pairs of earrings and a bracelet. You'll learn how to use headpins, open and close jump rings and find out how to use crimps. Students are to bring an assortment of beads they wish to use; time will be available during the class to select beads. Fire up your designs and bring your jewelry skills up to a whole new level! Join Iris on Saturday September 29th from 10am to 1pm. In this class you will learn how to solder circles of heavy gauge silver wire and transform them into earrings and stacking rings. We will begin with an overview of soldering tools, materials and techniques. Then we will fuel and fire up our butane torches and learn how to solder jump rings. Next we will discover how to create earrings and stacking rings by forming and soldering larger circles. Some metalwork finishing techniques will be discussed. 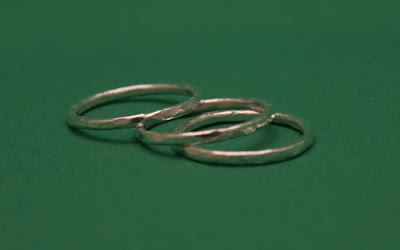 Time permitting, one set of earrings and three rings will be completed. This in depth workshop provides students with the opportunity to create an embellished ring or pendant. Students will be lead through the basics of using the clay. Techniques covered: Applying texture, sculptural aspects, colour blending and basic jewelry making techniques. Students will have the opportunity to work on many pendants, jewelry components and more. Crystal Clay is a two part epoxy clay that is easily mixed and formed into any shape. Working time is approximately 1 1/2 hours after mixed and clay is fully hardened in 24 hours. Simply mix and knead both parts of the epoxy clay together for several minutes. Add SWAROVSKI ELEMENTS fancy stones and bling out anything! Note: This is not a class, and is intended only for those that already have some experience with metal clay. Would you like to work on your metal clay projects in a fun, social and supportive environment? Join us during our periodic play days. We will provide access to basic tools and texture plates, but you are required to either bring or purchase your own Art Clay and supplies. You may also peruse our extensive library of videos and books during the day. Kiln time will also be available for a nominal fee. In the class you'll learn how to make the chain using cold connections and you will learn how to make a clasp. We will make some wrapped beads that you can add to this bracelet. We continue to feature this enchanting bead quilt that Marg got at the charity auction at Bead and Button. The squares are made and donated by beaders from all over the world. The quilt is entitled "Glorious Green" and the theme: Birds. The artist's name precedes their work. OK, it is actually Friday night while I am writing this. I was hoping for a beautiful fall weekend to enjoy the outdoors but in checking the weather it looks like it will be a rainy weekend. I have decided it is time to tackle the project I have been avoiding for a long time. Cleaning and re-organize\ing my studio. So here I go, I am making the commitment to devote my attention to this overwhelming task. To be completely honest my ability to maintain a tidy workspace has never been a strength of mine. I take a "mad scientist" approach to my creative/artistic part of life. For me this is where I can let all the rules slip away and go crazy. This has been therapeutic but this approach combined with husband and children encroaching on my space has thrown my studio into complete chaos. On top of that is located in the basement not the most cheerful of locations which can get more depressing especially sincea few light bulbs just burnt out down there. No more procrastinating, it is going to happen! One of the biggest challenges is break the daunting task into parts. Here is my advice to myself. ( It is yet to be seen whether I am going to take it). Make a list and a plan of attack to help you focus. Set small goals so that you can see progress and you don't get discouraged and give up. Good advice for one who often tasks a tornado approach to tidying up. Lighting - Make sure your workspace is well light. This is obvious as you need to see your work but bears repeating especially if your studio is in a basement or a dark area without windows. Lighting is key. Also consider things that may make the place seem less like a "dungeon" such as a plant or photos. I better get light bulbs replaced. Play some upbeat music. Music heals the sole and can inspire. Sometimes it can get you moving so you clean faster. Take breaks. Make sure your break involves leaving your space and doing something completely different. Although I am not always good at this piece of advice in the past, (I often put my head down and try and run a marathon clean up session - which always leads to me crashing). When I "behave", I try and make sure I leave my house and get a complete change of scenery to help recharge my energy.. Consider getting rid of stuff you are not using. Oh my, did I just say that. I don't think I am the only one who holds on to things just in case it will be useful. I have managed to make significant changes in this area in my day to day life but when it comes to my metal clay and my creative part of my life, I have so many things that I am holding on too. Time to purge and pass on. This one is going to be hard. I will have to start a give away box and pass the on to my Metal Clay Group and friends who may be able repurpose some of these items. Don't get mad if it the task is complete as fast as you want it. I liken this to loosing weight - it takes a while to gain weight and it will take a while to take it off. We rarely get to where we want to be as fast as we want. Be patient and keep at it. 7 Tips to Clean up Your Art Act by Karen Maraney - this one is not directly about studios but there are good tips too. The Business Chat - Merry Christmas! Yes, you heard me people, that sound is on its’ way. In just 3 months we’ll be cozying up to glasses of holiday cheer and frantically wrapping presents. Wouldn’t it be nice if a whole lot of your work was being wrapped as presents? And not by you, but by customers of yours. If we’re going to get our work under some Christmas trees we need to do some serious thinking and planning right about now. In my summer craft show booth I’ve had people doing holiday shopping since June. Those super organized people are great but most people don’t start doing their holiday gift shopping until the weather has that nip in the air that says that winter is coming. There is a nip now. Let’s get to work. There are 5 steps to a successful holiday sales season. Know your goals. Plan how you are going to reach these goals. Marketing and advertising. Marketing is telling your customers what you do. Advertising is how you get the message to them. This is where we’ll plan our newsletter, and social media strategies. Also our booth signage and other marketing materials. Building your display. You have 2 displays to think about. You have your craft show booth (assuming that you’re doing one or more) and your online store. Sales. Actually exchanging your work for money. Let’s talk tips for increasing your sales. First up is to set a sales goal. Always remember, you can’t have a successful sales season unless you know what success is. What do you want from this season? Is it a number? Is it a launch of a new product or is your business brand new and you want to get started? Do you want to pay for a month on a beach from your profits? It’s your business, it’s your success, it’s up to you to define it. Write your goals down and post that on a wall somewhere you can see it. Craft shows. Most craft shows book 6 – 12 months in advance however there are always opportunities available. Have you booked a holiday show yet? If not, then go and find one. Online – your own website, facebook, etsy, other gallery sites. If you are not yet set up for online sales there is still time to create an online presence. Hosting a home party. Or have someone else host a home party for your work. Selling in stores. For those crafters who have their work in a store the holiday season is a great time to expand your presence in that store. For makers who are not yet in stores and want to be, you should approach the stores very soon as most store will already have their holiday lines picked out. Once you have decided which way you intend to sell your work you need to think about how these sales will meet your goals. If your goals are financial can you sell at your choices to meet your numbers? For example, let’s say you want to sell $2500. You have booked one small craft show which cost $75, so you can expect to sell $750. You also have a website. This means that your web sales will have to be $1750 for you to meet your goals. That’s up to you to think if it’s realistic. Maybe you should find another 2 or 3 craft shows. If your goals are to get your name out there and let the world know about your new venture then the numbers aren’t quite as important. Maybe you should be thinking about creating a strong Facebook presence or a website. A craft show is really great for getting your work in front of a lot of people quickly. Whatever your goals are now is the time to decide. The next few weeks we’ll be talking about the steps in making your goals a reality. The jolly fat guy in the North Pole may not be real, but success is. We just have to make our own. Since we’re makers, it’s no problem. One of her pieces has been accepted for the July 2013 issue of BeadWork Magazine!!! You can see more off Pam's work on her website Peyote Dreams. Pam is a popular teacher at BeadFX. I have personally taken some of her courses - Herringbone Bracelet as well as Sparkly Wheels. She is very patient and knowledgeable. If you haven't taken a class with her yet, I suggest you do - and conveniently she has some coming up! Do you want to create jewellery for yourself but have no idea where to start? Join us for this ‘newbie’ course and discover just how easy creating jewellery can be. Participants will make a couple of pairs of earrings and a bracelet. You’ll learn how to use headpins, open and close jump rings and find out how to use crimps. Students are to bring an assortment of beads they wish to use; time will be available during the class to select beads. Class will be held at BeadFX, 19 Waterman Avenue, unit 2. Class fee: $35 + HST; Kit fee: $12, includes an assortment of findings (headpins, earwires, clasps beading wire to complete 2 to 3 pairs of earrings and a bracelet. Class will take place at BeadFX, 19 Waterman Avenue, unit 2. 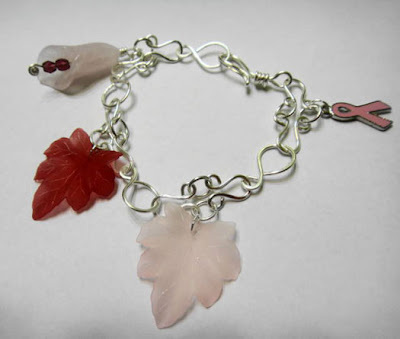 Class fee: $35 + HST; Kit fee: $18, includes enough fire-polished beads, seed beads and findings to complete a bracelet. Various colour choices will be available. Regaliz/Licorice leather is all the rage and you can create a stunning accent for your leather bracelet. Using only jump rings, students will learn how to do open-weave chainmaille and discover how it can be used to encase leather and other materials. Students will need to supply enough Regaliz/Licorice leather, appropriate clasp and two Regaliz beads of their choice. Class will be held at BeadFX; 19 Waterman, Unit 2. Class fee: $35 + HST; Kit fee: $8, includes jump rings, wire and complete instructions to complete the project. 6mm fire-polished beads and delica beads create a colourful and stylish bracelet. Reminiscent of the traditional Xs and Os (Hugs and Kisses) design, the bracelet will be able to be completed within the class time. Summer is starting to wind up - in fits and starts - warm day, wet day, cold day. Are you starting to think about winter projects? Are you making gifts this year? The time to start is now! If you're thinking about a nice beadwork project, and would like to bead around something special, how about this new selection of drusy cabochons! Druzy is crystals formed on stone - often deep inside round geodes or thunder eggs. They have a sparkly texture - and they look really cool! From wildly irregular to calmly oval - we have a fascinating collection of them! Check them out! But maybe this chain will convince you to do some "leaf"-ing. This matte black leafy chain is just about the sexiest chain you can think of. It just doesn't need any adornment at all. But that doesn't mean that you couldn't wire on some crystals into all those links and make something so fabulous that your friends will swoon at your feet with desire. And, who doesn't consider that time well spent? And if you're feeling shell-fish - then how about this charming scallop shell adorned chain in Antiqued Copper? Or Antiqued Silver? We have delicate and dainty chain - in Antiqued Brass. Given the age of this chain - that patina might actually be natural and not applied in the factory! Or - something more robust - more of a statement chain - with an Art Deco vibe. Seedbeads? 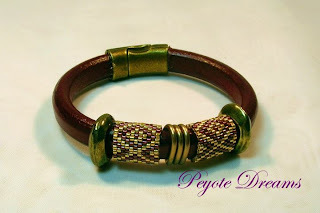 Peyote stitch? Do I have your attention? How about this - a quick and easy way to get started without confusion over the first and second row, keep the tension nice - and eliminate false starts! Don't believe me? Check out this video! I'm so excited about this - I want to try it! Currently - we have them for size 11/0s - but if you like them, we'll get more sizes! If you love the Swarovski Filigree beads - then hey - two more colourways for you - Purple Velvet and Crystal Copper on Gold, and Light Topaz and Cobalt on Silver so bright it is almost white! And, as always - wonderful things all over the site - so click on a link or an image to go straight to the item mentioned, or go to our massive list of everything and look for the "new" tags. If that page seems overwhelming - which we freely admit it is! - then try for bite-size portions by checking out these categories: Firepolish, Pressed Glass, Swarovski Crystal, Seedbeads, Stone and Pearls, Preciosa Crystal, Metal Beads, Other Cool Beads, Findings, Metal Clay & Supplies or Books, Kits, Tools. Are you the Girl with the Pearl Earring? The Joy of Metal Clay: Food? Anne Mitchell - This weekend!